Anchor's Our Special Ale (I guess they will eventually update that link to 2017), which the label says is ONLY sold early November to mid-January, was on my liquor store shelves early October (Purchased 10/7/2017)! Not sure if someone screwed up or if that's just a target release. Anyway, I couldn't find anything about this beer online, no Beer Advocate or Ratebeer or updates on the Anchor website, NADA!, so naturally I will publish immediately in case I'm breaking some news. 2017 is year 43 for Our Special Ale, Anchor's Christmas Ale. 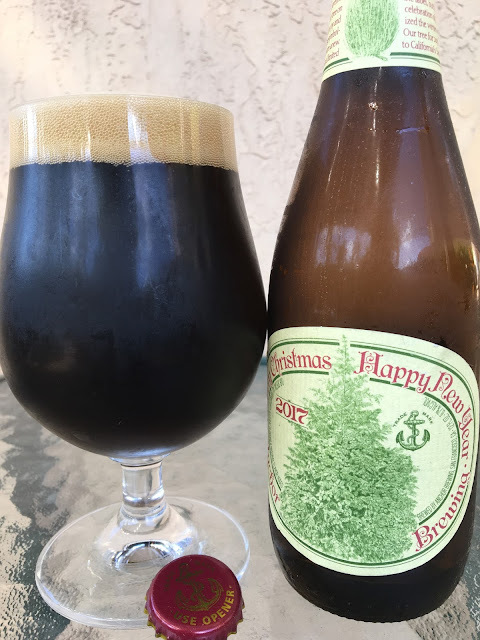 Each year, the brewery puts together a new recipe and puts a new tree on the label to represent the joy and celebration of the newness of life. This year's tree is Abies bracteata, the Santa Lucian Fir, one of the rarest firs in the world and limited to the slopes and canyon floors of California's Santa Lucia range. Beautiful tree! The beer recipe for this year, well that's also another mystery, since the label is less forthcoming about that (even style) than it is about the trees. I guess I'll compare notes after they really release the beer! 6.7% alcohol. Chocolaty aroma. Malty, chocolate flavors as well, with a good dose of bitterness to follow. My style guesses are either a dry stout or a very tame Black IPA. I went with the Black IPA choice. Creamy, smooth, not harsh. Very nice beer. Check it out. You're absolutely right, Anonymous. Grabbed my magnifying glass and took it to my local liquor store this morning. It's been updated. Thanks.